Location: Hicks Lake is located in British Columbia's Sasquatch Provincial Park. Hicks Lake is only a couple of hours east of the city of Vancouver, BC (for the majority of the time on Hwy. #1). It is 11 km. (6.8 mi.) northeast of the popular resort of Harrison Hot Springs on a well signed road that is car accessible even though the last 6 km. (3.7 mi.) are gravel. 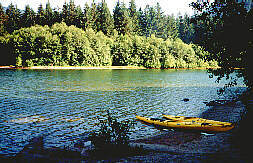 Resorts & Campsites: In the midst of Sasquatch Provincial Park, Hicks Lake has camping facilities and a boat launch as do a number of other nearby areas in the park. Full accommodations and services are available in Harrison Hot Springs. Fishing Report: Cutthroat is the predominant game fish, usually averaging 1+ lbs. Hicks contains moderate quantities of aquatic insects and leeches. There are restrictions on engine power (10 H.P.). Viewscape: The area is predominated by tall mountains, forested with a mix of coniferous and deciduous trees. In the east and west, the slopes are steeper than the flatter north and south ends. Shoreline: Most of the shoreline is covered with gently sloping sand and gravel beaches. Some areas are covered in aquatic plant life. The beaches on the west and north shores are steeper and are mainly covered with rocks and boulders. 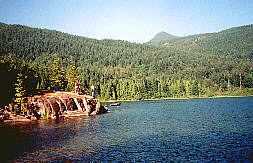 Deer, Moss and Trout lakes are all small lakes located in Sasquatch Provincial Park. They all contain fair to moderate numbers of small, stocked, Rainbow trout. Moss Lake requires a bit of a hike but is well worth the effort for larger fish to 2+ lbs. have been reported being caught there. 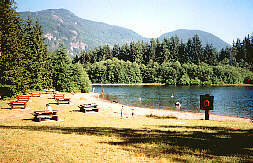 Camping sites are available at Deer Lake.